2. Why didn’t I think of this? Thanks to Daniel for pointing this out. My mom likes to tell the story of my first Christmas as a toddler, in which I nearly hyperventilated while jumping up and down in my Johnny Jumper at the first sight of a wrapped present. These days I can usually keep my excitement under wraps, but when Josh from Skillet sent me a jar of BACON JAM I could feel my heart rate go up and my breath quicken. I was in the middle of a conversation which I quickly broke off when I spotted the package on the mail shelf. I tore into the box to find a small jar of dirt-colored paste. Honestly, it did not look appetizing, but that didn’t stop me from opening the jar right there in the lobby. I took one whiff of intoxicating bacon and plunged my finger right in. This stuff is GOOD. Packed full of bacon, but also tempered with caramelized onions and a vinegary counterbalance that reminds me of chutney. I tried it on bagels with a bit of turkey (YUM), as a pizza base (YUM) and even stirred it into cottage cheese as a snack (YUM). I can’t wait to head down to Skillet and try it on their burger. What happens when a vegetarian starts eating meat again? 30 days of pork. The second annual Independent Food Festival is here, and I have been asked to give an award. 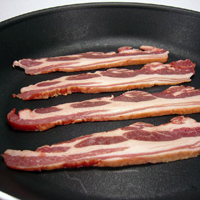 I know it’s predictable, but something in the world would be amiss if I didn’t give my award to bacon. Not that I’m giving this award out randomly; this bacon truly deserves an award—or maybe even several. 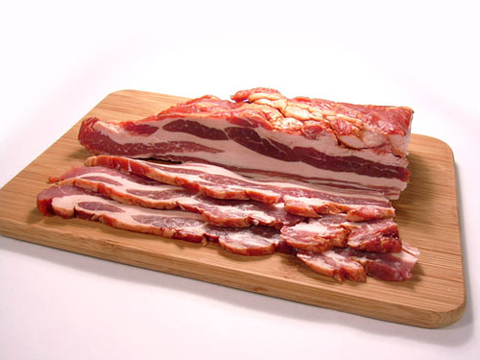 So I present to you the 2006 Independent Food Award – Best Result of Pigs Gone Wild: Wild Boar Bacon. I discovered wild boar bacon about a year ago and ever since have made it my mission to introduce it to as many people as possible. I’m like a drug dealer except what I’m pushing is legal and much better than crack (so I’m told). In researching my award, I was shocked to find out that there are an estimated two million wild boar (a.k.a. feral hogs) roaming wild and free in the state of Texas. So many that they are deemed pests—albeit 200 pound pests with razor sharp tusks and a nasty fighting technique called disembowelment. Wild boar are also 90% vegetarian (i.e. they create significant crop damage) and have no natural predators, so hunting season for wild boar is open year-round with no limits, and can be hunted by any means possible, at any time of day. For this particular bacon, the meat comes from Southern Wild Game, Inc out of Devine, Texas where freelance trappers can exchange their hogs for cash. The wild boar are then sold to Sierra Meats in Reno, Nevada, which then sends the bellies to Dale’s Exotic Game Meats in Brighton, Colorado for smoking. The boar bellies spend 2-3 hours in a vacuum tumbler with a salt and sugar brine, then are cold smoked over hickory for 10 hours. 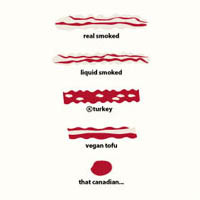 Then the bacon travels to Exotic Meats in Bellevue, Washington where it can be purchased by the public. Yes, the food miles are ridiculous, but this bacon is so worth it. UPDATE: Keiko just posted a beautiful award for rare breed pigs… check it out! Beautiful raw slab with deep, deep red meat—colored more like venison or elk than pork. Very hard to visually tell the “grain” of the meat, but knife meets slight resistance if cutting with the grain. You want to cut against the grain, otherwise the bacon is too chewy. Optimal cooking requires low heat for a long time in order to render fat and crisp bacon without burning; it’s like torture waiting for bacon to cook as the smell is incredible. Extreme shrinkage was evident, due to the large amount of fat rendered. 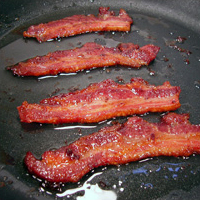 Keep fat at all costs, it’s simply amazing to cook with—much more flavorful than regular bacon drippings. Flavor is out of this world. I wouldn’t call it gamey, but it has a pronounced, rich pork flavor that’s almost sweet. The bacon tasted almost maple-y and bordered on slightly too sweet and too salty, but the whole combination was heady and gluttonous in the best possible way. This is bacon that’s meant to be savored. I just received Archie McPhee’s latest newsletter and was floored to see that they now sell Gummy Bacon. Brilliant!